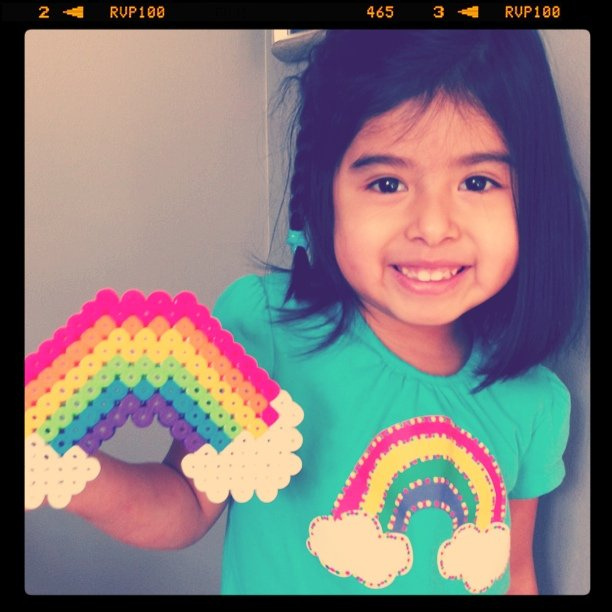 One of EJ's favorite things is a rainbow (rainbows are right up there with tigers and ballerinas)! So the other day she completed her third biggie bead creation (she has made a rainbow fish, a butterfly & the rainbow) and she was so proud. The next day she wore a new shirt and Matt realized that she matched her art...yeah, she made me take a picture. How can you refuse those dimples? In other news, this year we talked with the kids about the Lenten season and about making sacrifices during this time. They were very interested and are all giving things up. EJ & Olivia are giving up a toy Jack just got (but that they all love very much) and Jack is giving up his DS. Matt is giving up games on his computer which actually worried EJ a bit..."I have games on your computer too Daddy!" I'm giving up a lot of dimes. Yes, clearly I should be giving up my Diet Coke habit, but that's not really going to work for me. Am I making excuses? Sure. Am I being honest? Yep! Instead, I am putting a dime in a jar every time I get a Diet Coke from the fridge. So far the act of going to get my dime each time (yes, it's 9am and I've already done this a few times) is making me mindful of how blessed I am with a home full of food, clean water, and plenty of Diet Coke! I hope we'll have some good dinnertime talks, as we did in past years with our Habitat project, and I know I'll be thrilled to donate all my dimes at the end of Lent.